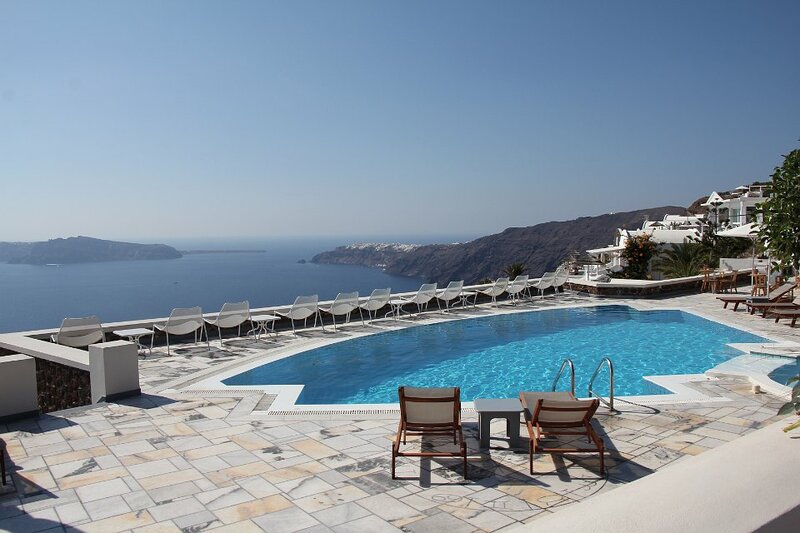 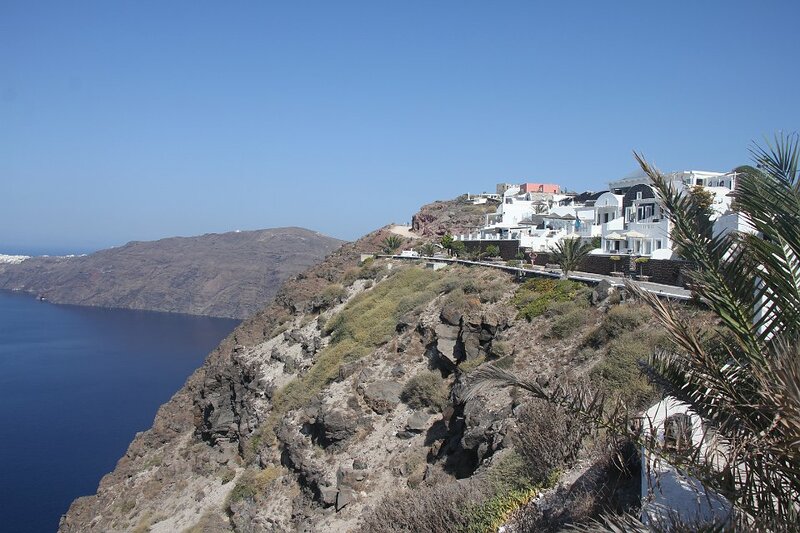 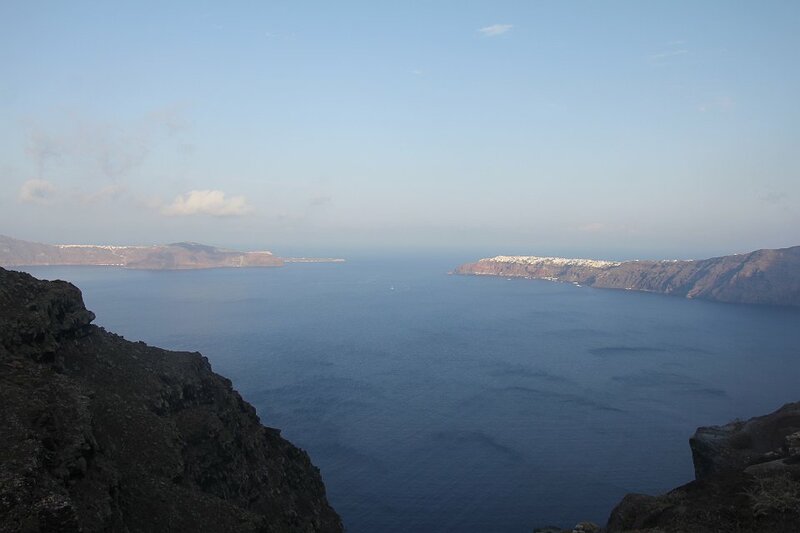 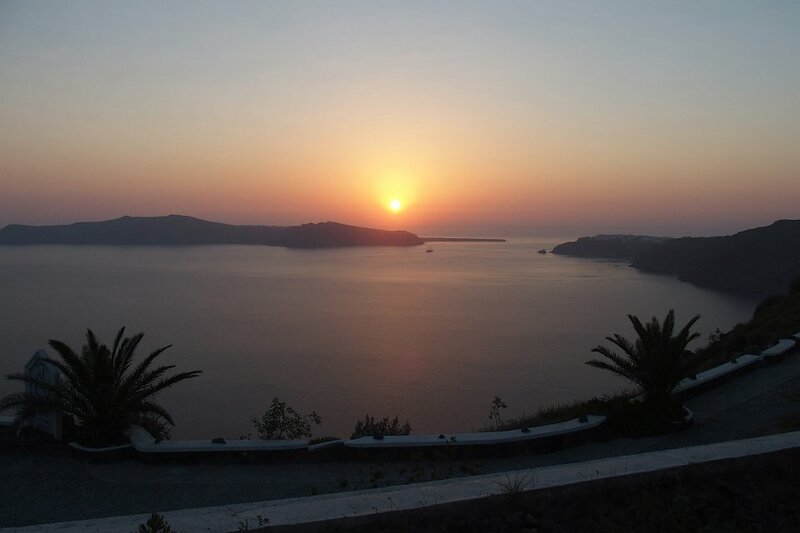 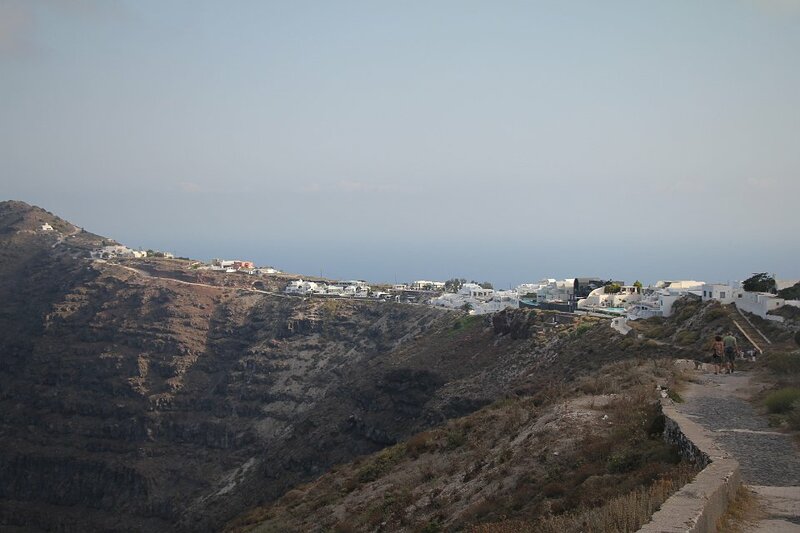 On Thira (aka Santorini), we spent four nights. 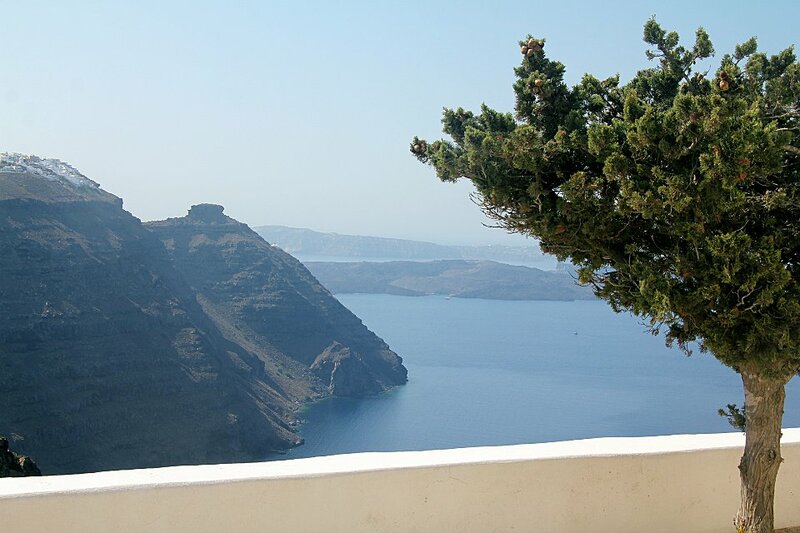 The island is quite splendid and there are things to be visited. 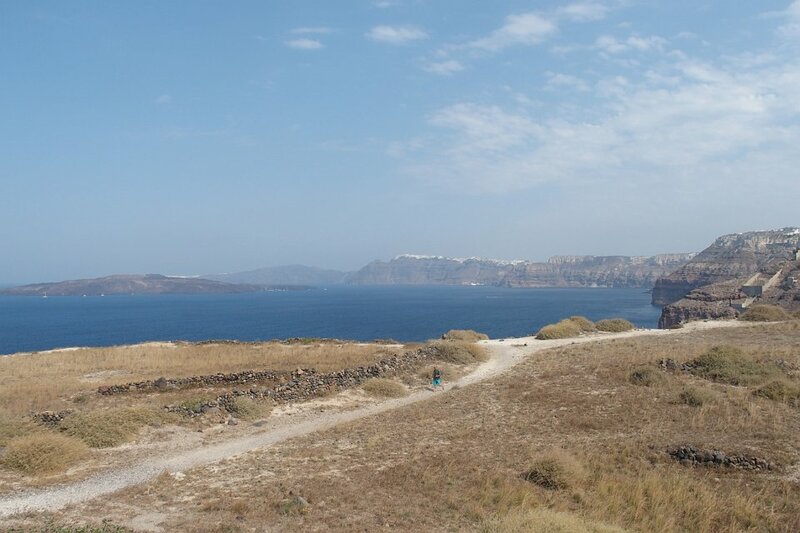 But there were far too many people and far too many cars. 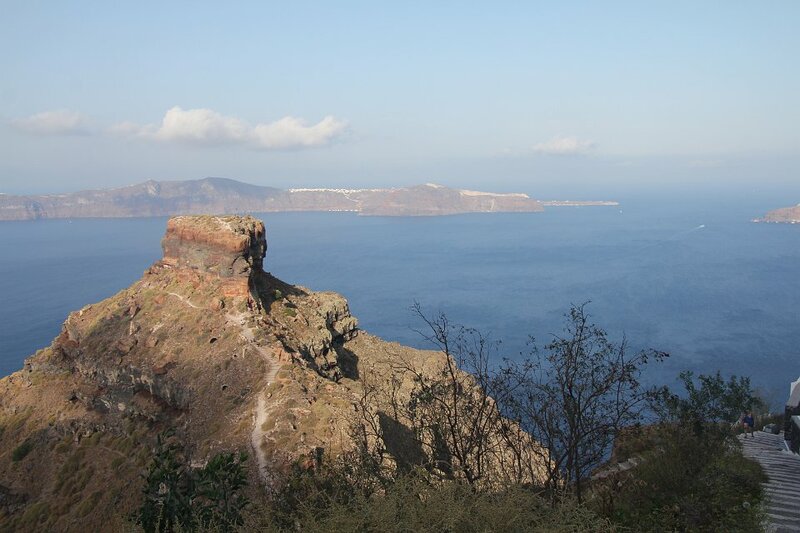 1 Looking north from our hotel along the caldera cliff towards Oia (pronounced "ya"). 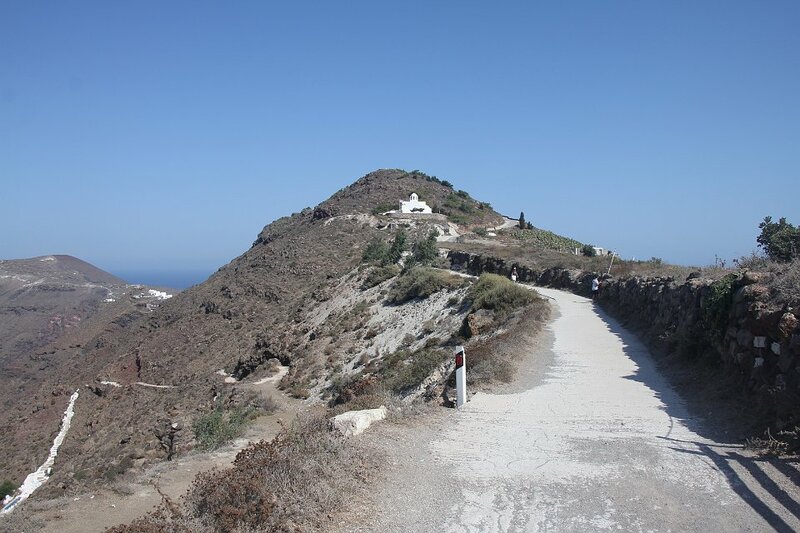 2 Steep climb down to that little church. 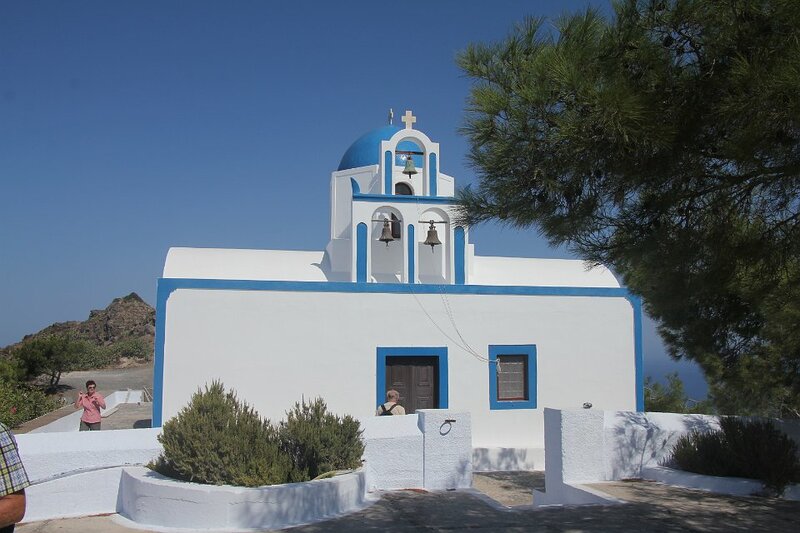 4 Small church up to which John walked. 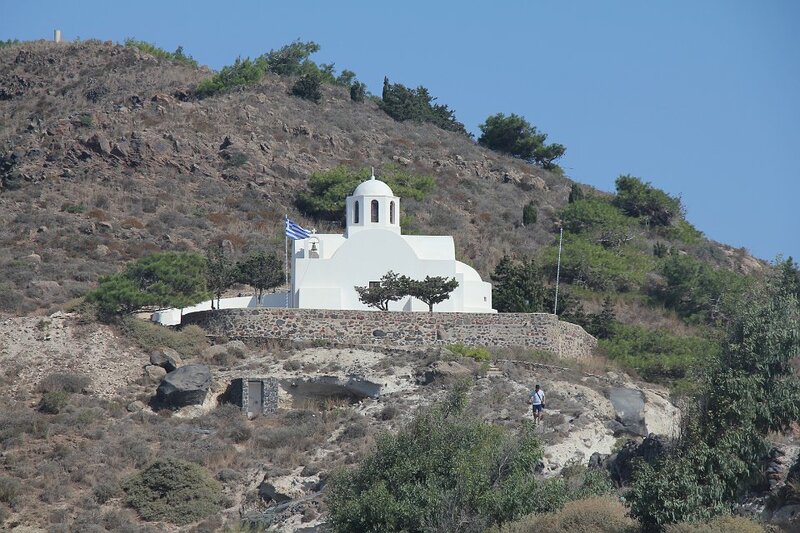 5 Looking from the church towards Imerovigli and Skaros Rock. 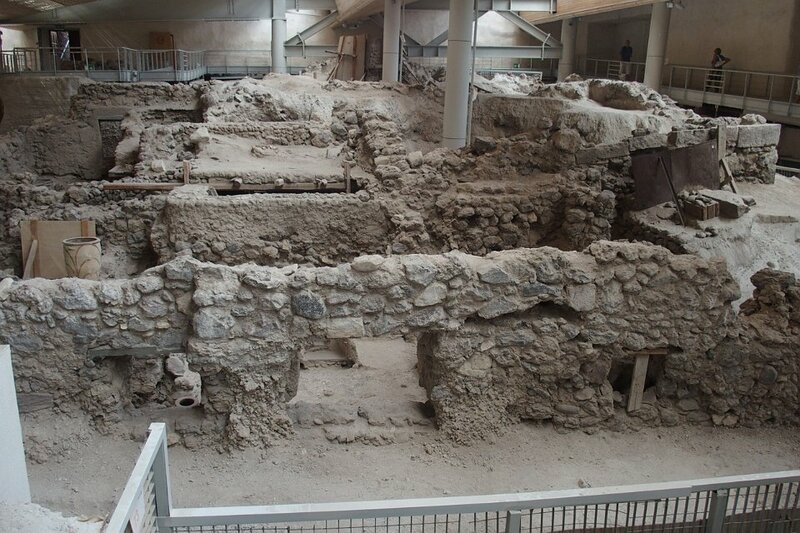 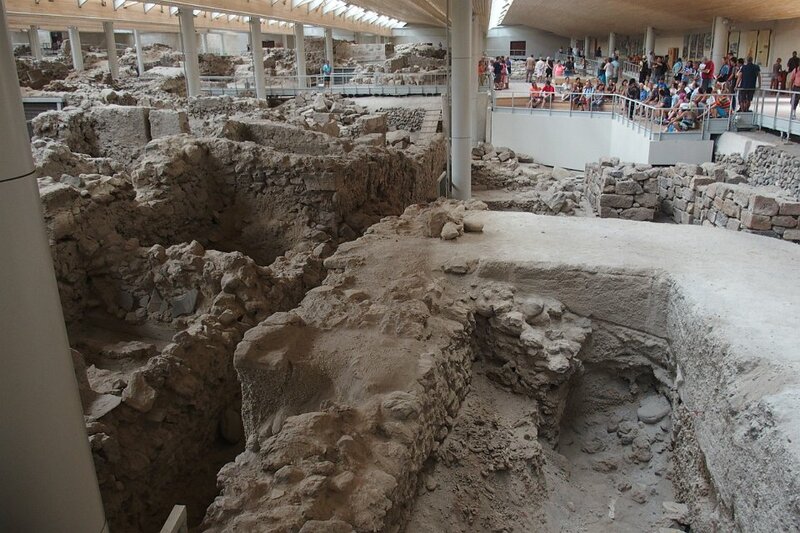 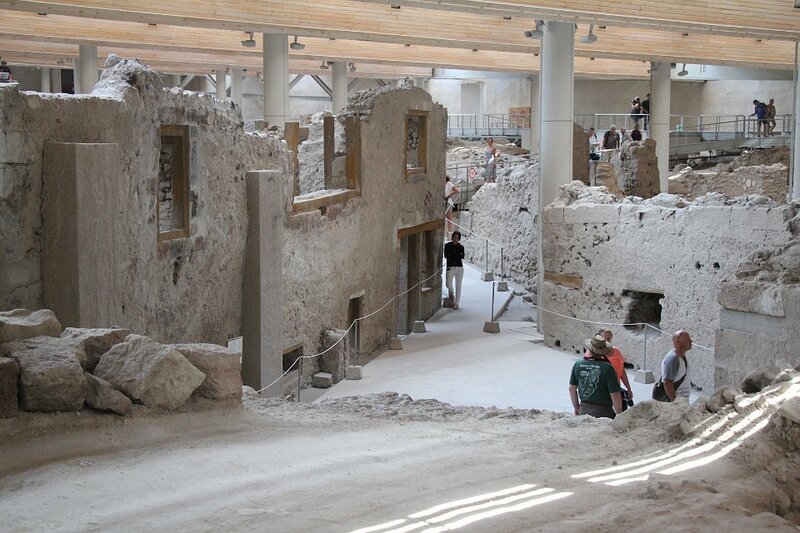 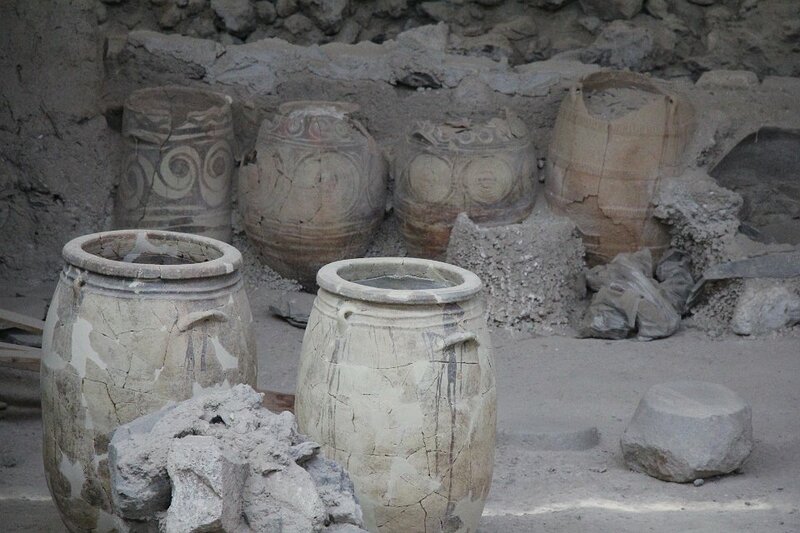 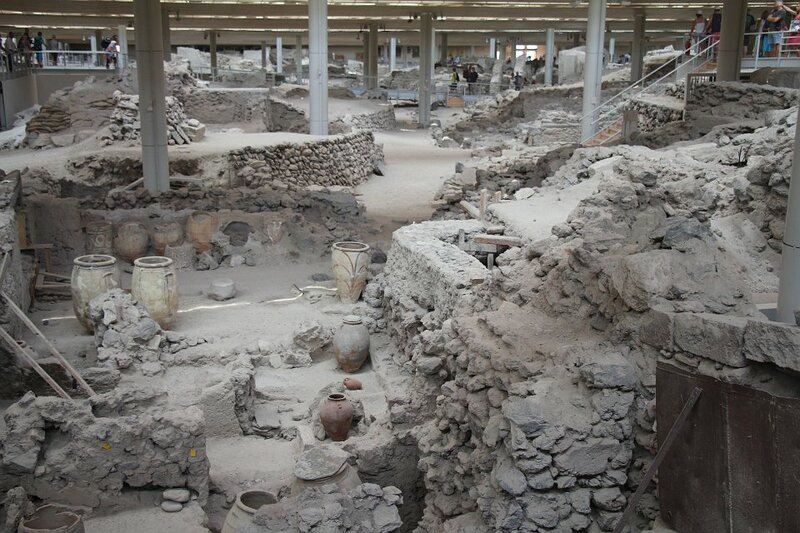 10 Like Pompei but much earlier, bronze-age Akrotiri was buried under volcanic ash and then mud around 1650 BCE (!). 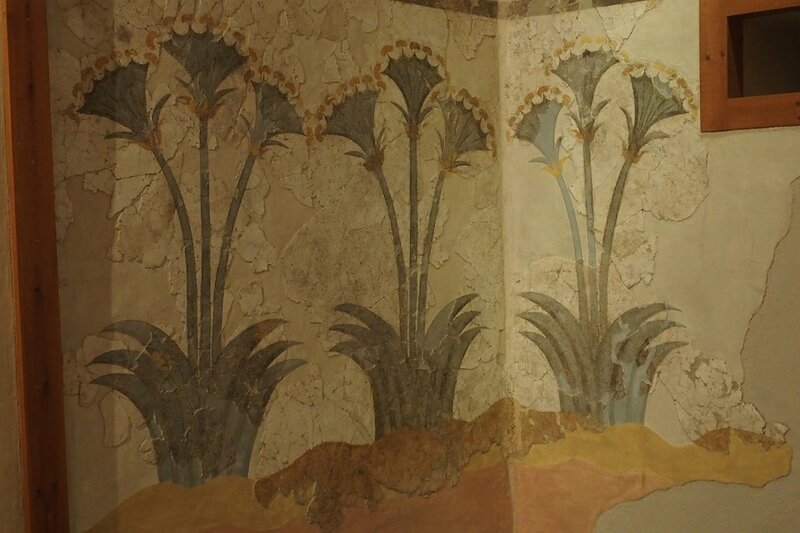 11 Double-horn square: In one of these builings was found the Spring Fresco of lilies and swallows seen in the Athens National Archaeological Museum. 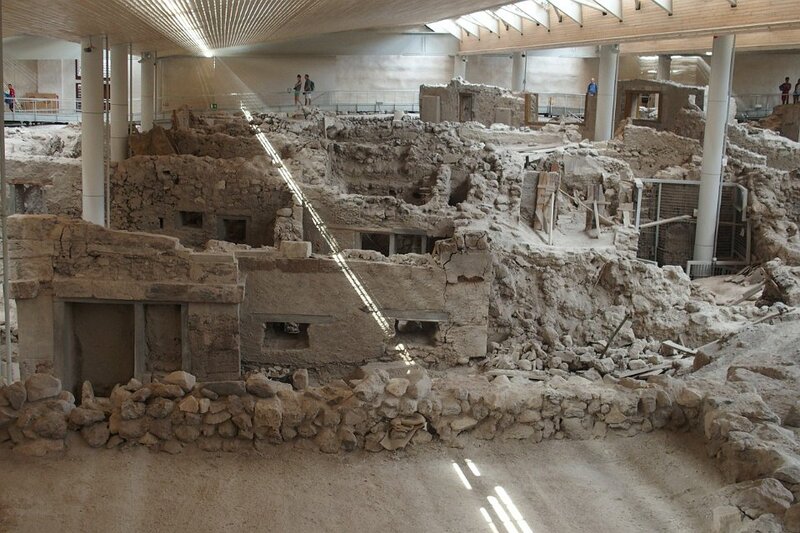 14 Looking down the main drag from the weaving room. 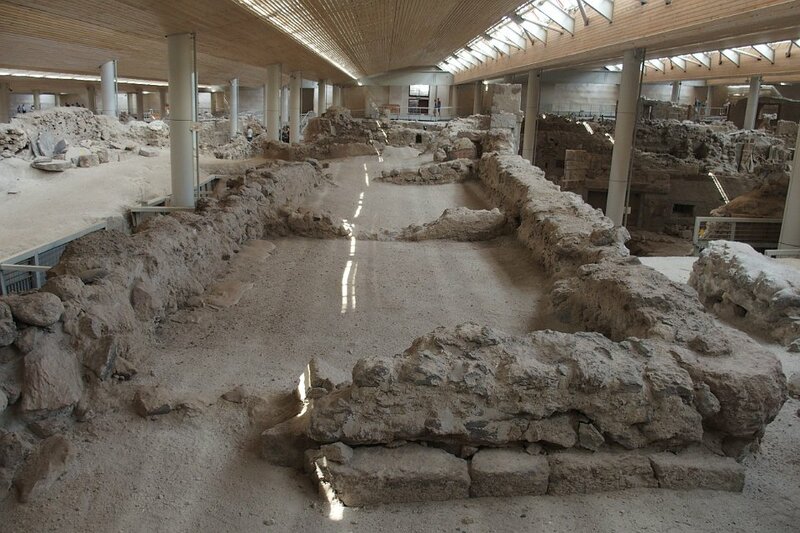 15 Fascinating old ruins always make us feel the passage immense quantities of time. 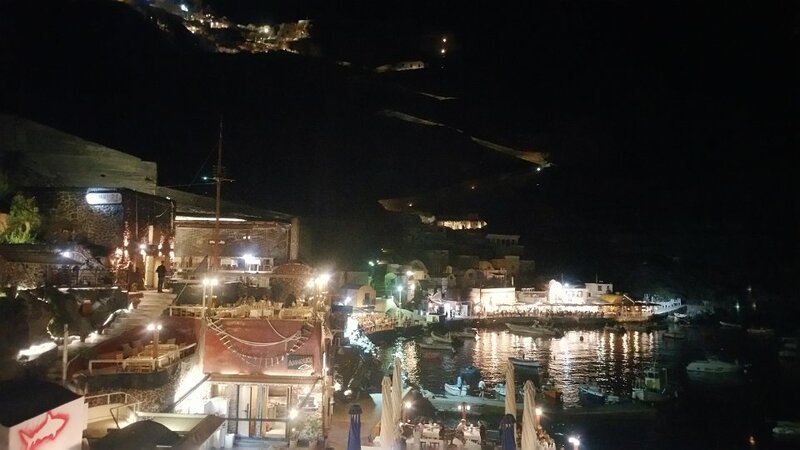 17 We had a delicious meal at the Ammoudi Fish Tavern, down by the water below Oia. 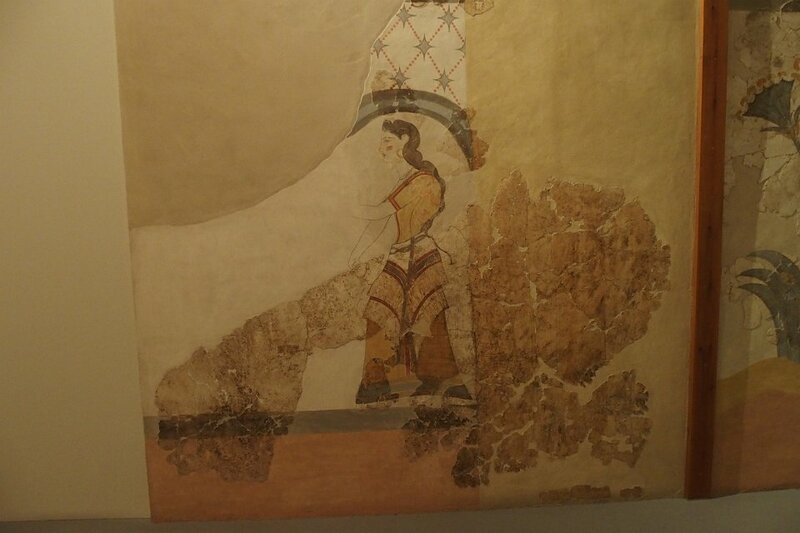 20 Fresco from Akrotiri, looks like papyrus. 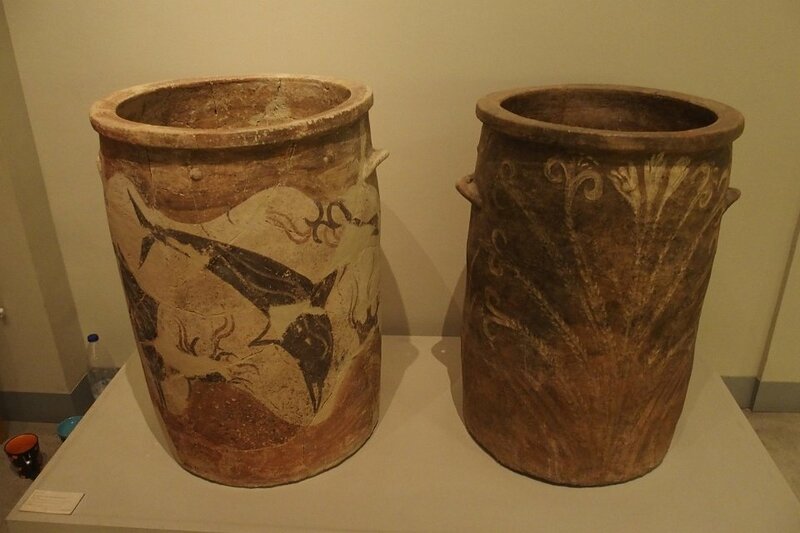 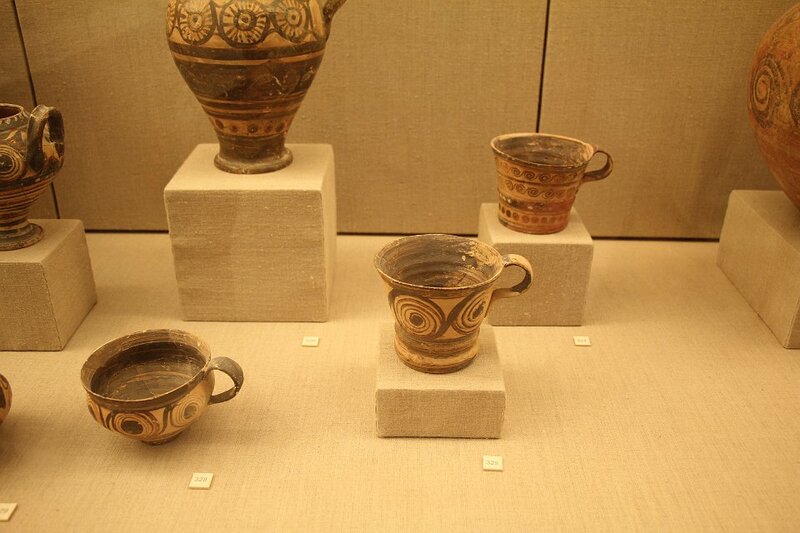 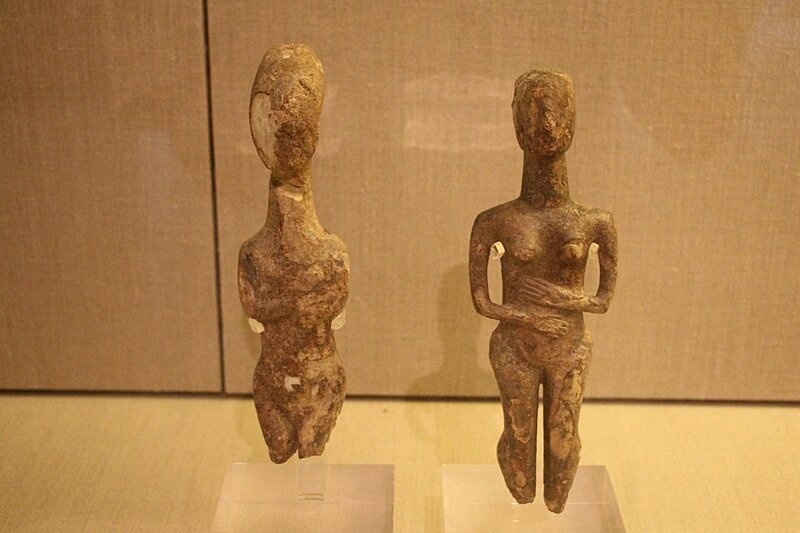 23 Jug and cups found at Akrotiri, imported from Crete. 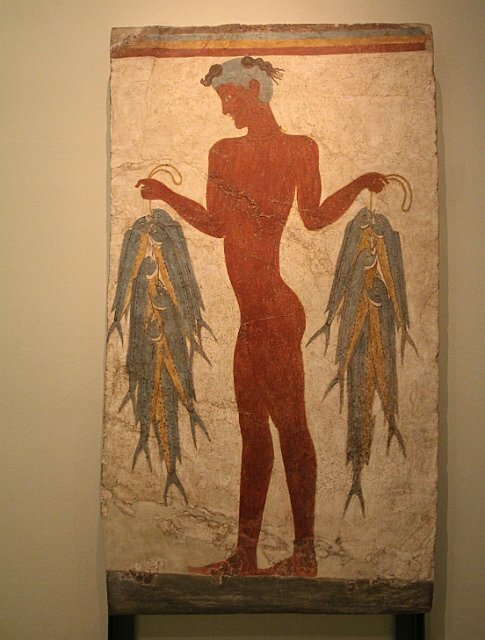 24 Fresco of young fisherman, from Akrotiri. 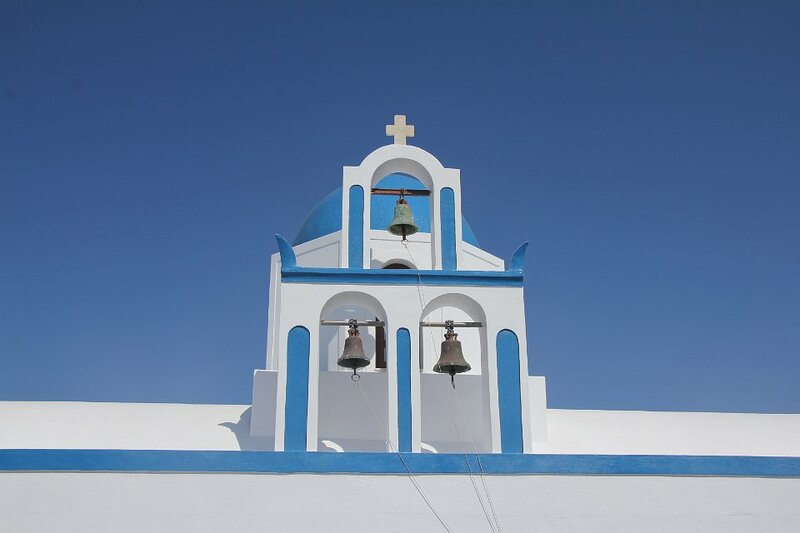 25 Jumping blue monkeys! 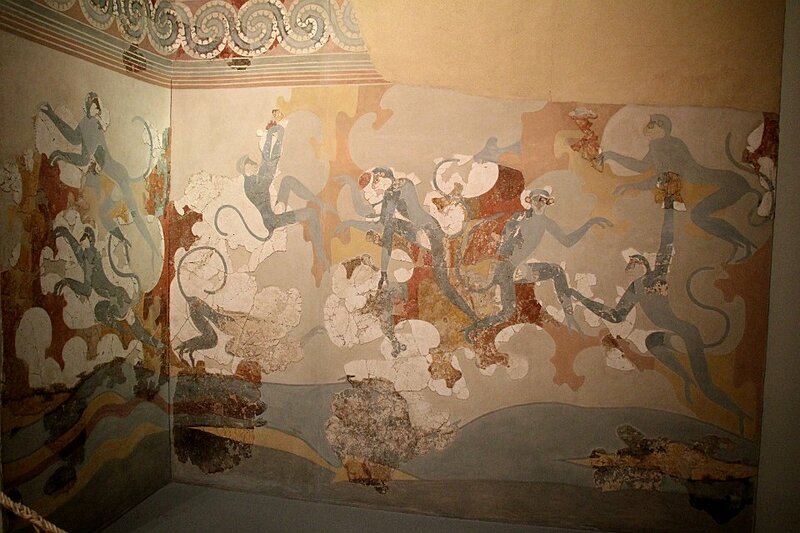 Amazing fresco from Akrotiri. 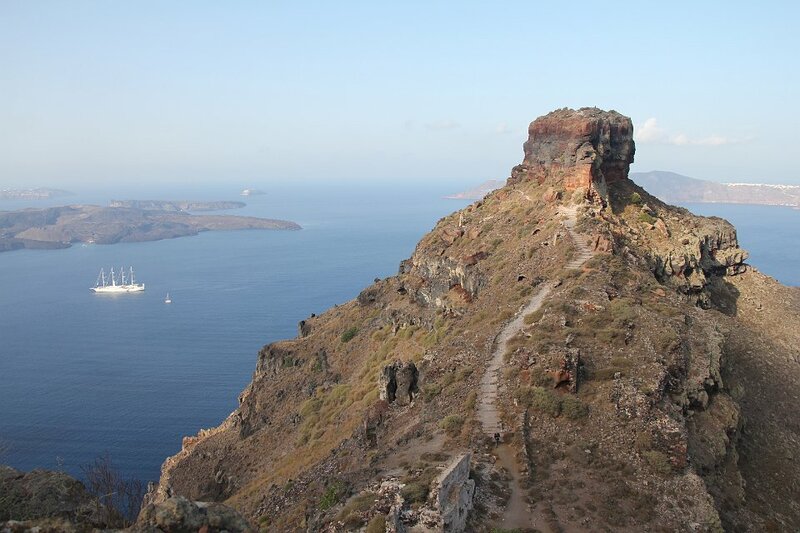 Were there monkies on Thira in those days, over 2700 years ago? 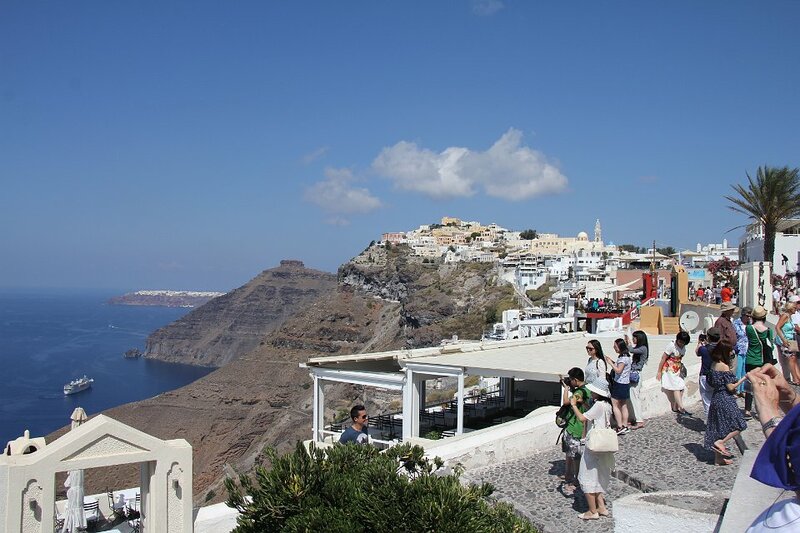 26 Fira, view towards ImerovigliTourists galore at Fira, looking towards Imerovigli and Oia. 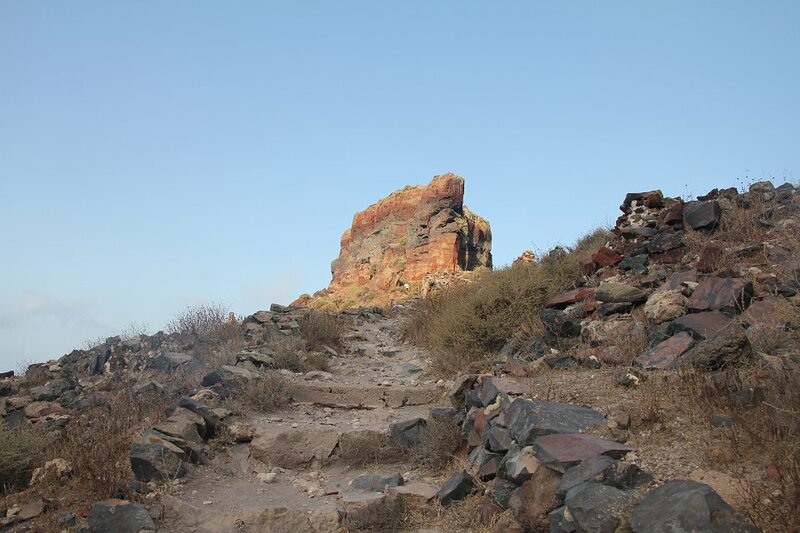 29 Skaros Rock in fresh morning colors. 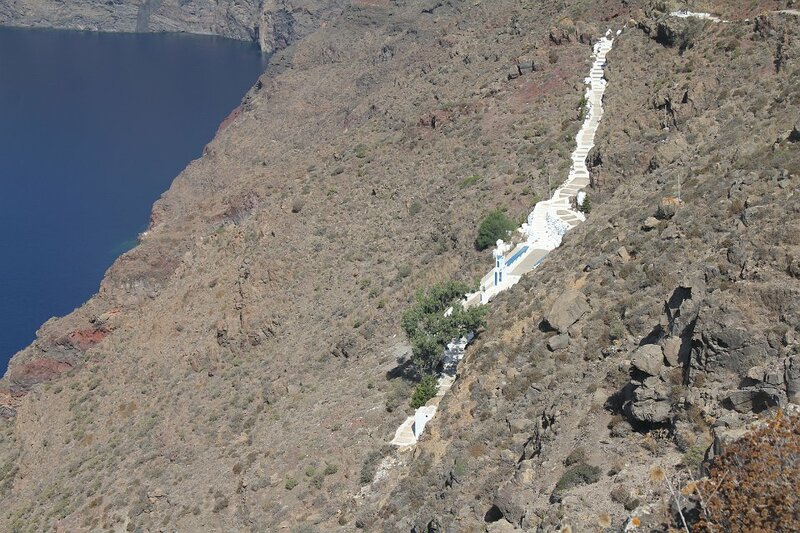 It still seems a long way down, and what goes down must come up. 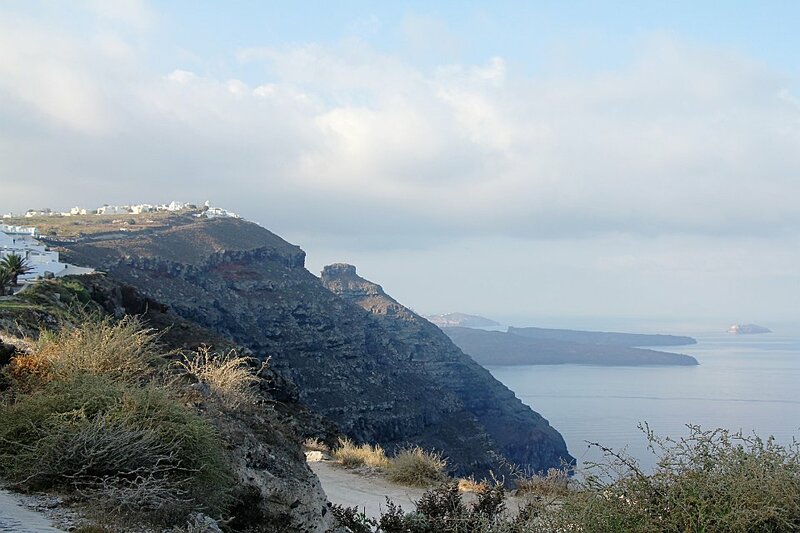 32 Skaros Rock looms above the caldera. 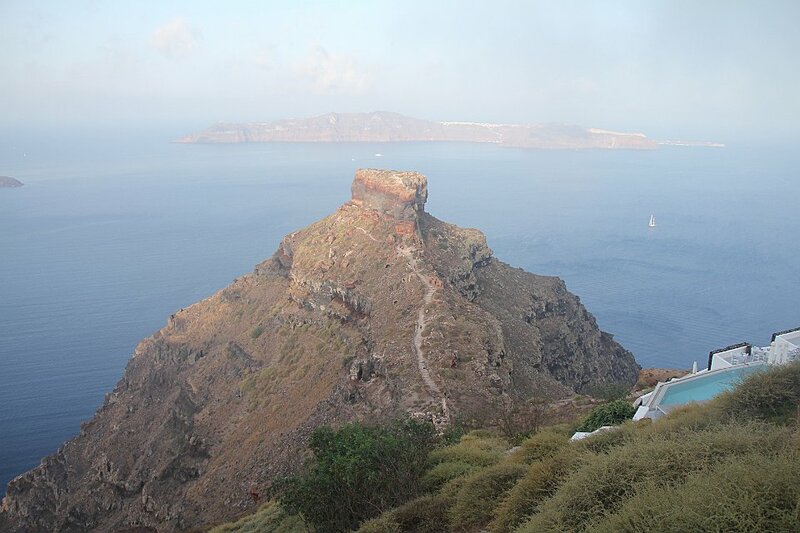 33 Skaros Rock and the caldera. 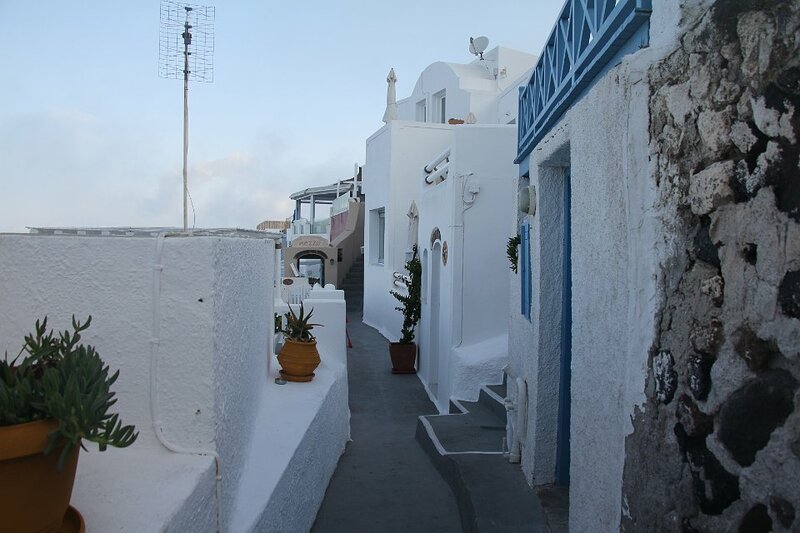 34 Coming back down from Imerovigli to our hotel, just to the right of the middle. 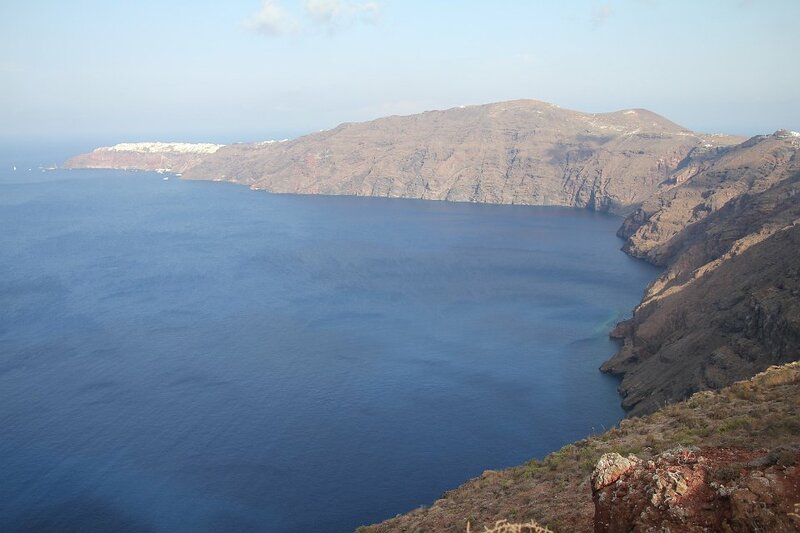 35 One last look at the caldera towards Oia, then off to the airport and a long afternoon's wait for a late airplane.